​Helen is one of the most famous female figures to appear in Greek mythology. Helen was the most beautiful of all mortals, and was given the title, of “the face that launched a thousand ships”, for an Achaean army was arrived after she arrived in Troy with Paris. ​The story of Helen starts in Sparta, at a time when King Tyndareus ruled it. Tyndareus was married to the beautiful Leda, the daughter of Thestius. 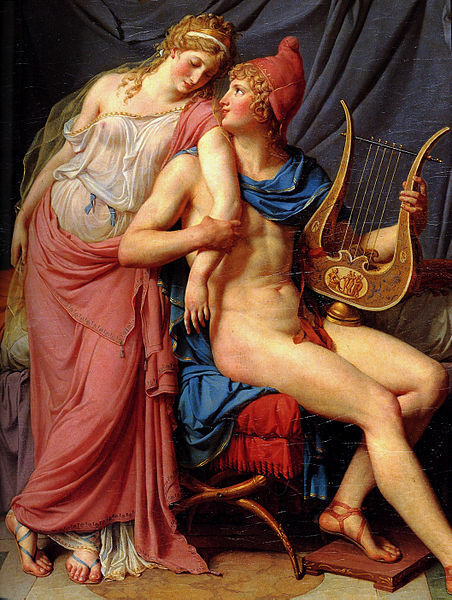 The beauty of Leda attracted the attention of Zeus, who came up with a unique way of seducing the Spartan queen. Zeus would transform himself into a magnificent swan, and arranging for an eagle to chase him, flew directly into the lap of Leda, imitating a bird in distress. 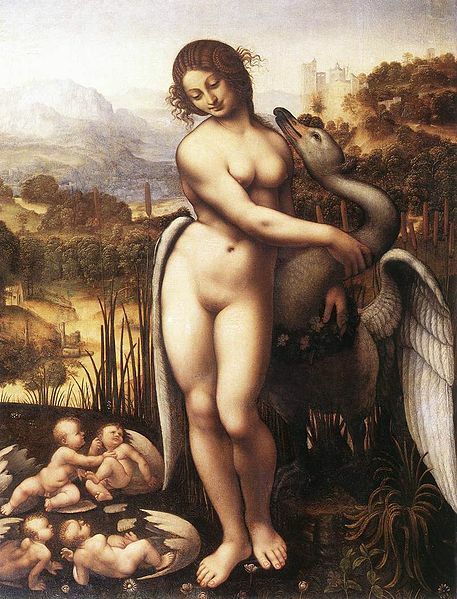 In the form of a swan, Zeus effectively mated with Leda, causing her to become pregnant. On the same day Leda would also sleep with her husband, and by Tyndareus she would also fall pregnant. As a result Leda would give birth to four children, Castor and Pollox, Clytemnestra and Helen; with Helen and Pollox considered to be the children of Zeus. Some say of how Helen was not born in the normal way, hatching from an egg instead. ​Alternatively, Leda was just the woman who raised Helen, for in this instance Leda was not the object of Zeus’ desire, for it was instead the goddess Nemesis. Nemesis, having no wish to sleep with Zeus, transformed herself into a goose, or a swan, and Zeus did likewise, and thus, Zeus still had his way with Nemesis. As a result, Nemesis laid an egg, which then passed into the care of Leda. ​Helen is of course famous for being taken by Paris to Troy, but this was not the first abduction of Helen, for years earlier, whilst Helen was still a child, she was forcible taken from Sparta by Theseus. Theseus and Pirithous had decided that they were deserving of wives who were children of Zeus, and so Theseus decided to make Helen his wife. ​The abduction of Helen was a simple affair, with no trouble encountered by Theseus and Pirithous, and so Helen soon found herself in Attica. When Castor and Pollox became aware of the abduction of their sister, they raised an army and marched upon Theseus’ Athenian kingdom. Theseus was not present, for he was captive in the Underworld with Pirithous, and so the Athenians willingly capitulated to the Dioscuri. ​Theseus would lose his throne to Menestheus, and he would also lose his mother, for Helen was discovered in Aphidna, where Theseus had hidden her with Aethra. Aethra then became a prisoner of Sparta, and the handmaiden of Helen for many years. ​Back in Sparta, Helen would eventually come of age, and King Tyndareus sent heralds out across Ancient Greece to proclaim that worthy suitors should present themselves at his palace. The beauty of Helen was well known and kings and heroes came from across the ancient world to try and marry her; this though led to a dilemma for Tyndareus for how could a husband of Helen be chosen without offending the other Suitors of Helen? Bloodshed and ill-feeling between some of the greatest warriors of Greece was now a possibility. It was Odysseus who came up with the idea of the Oath of Tyndareus, an oath which would bind each Suitor of Helen to protect the chosen husband of Helen, and none of those present would likely break an oath, and if they did, then the other Suitors would be bound to seek revenge on that individual. 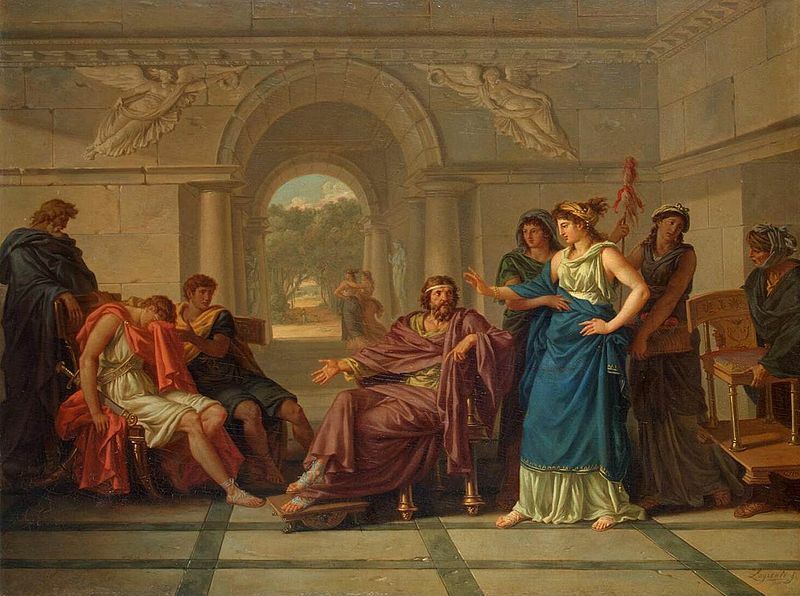 Thus it was that Helen was allowed to choose her own husband, and Helen would therefore wed Menelaus, a man who had lived alongside Helen in Tyndareus’ palace, following his, and his brother, Agamemnon’s, exile from Mycenae. Tyndareus would afterwards abdicate the throne of Sparta in favour of Menelaus, and so Helen became Queen of Sparta. ​All was well in Sparta but events that were occurring in the world of the gods would soon have a profound impact on Helen. Three goddesses were competing for the title of fairest, or most beautiful, of all the goddesses; these goddesses were Aphrodite, goddess of Love and Beauty, Athena, the goddess of Wisdom, and Hera, the goddess of Marriage, who was also the wife of Zeus. A judge had been appointed to make the final decision; which would be the Judgement of Paris, named for a Trojan prince Paris, a mortal known for his impartiality. The three goddesses who were to be judged though decided not simply trust to the impartiality of Paris, and instead offered bribes. Athena would offer knowledge, Hera offered dominion over mortal realms, whilst Aphrodite promised the hand of the world’s most beautiful woman. In the end, Paris chose Aphrodite as the most beautiful of the goddesses, resulting in Aphrodite becoming his lifelong benefactor, whilst Paris also gained the animosity of Hera and Athena. Aphrodite would also make good on her promise, and of course, the most beautiful of women was Helen. Paris would come to Sparta, in the guise of an envoy from Troy, but when Menelaus was called away, to attend the funeral of Catreus upon Crete, Paris was left alone with Helen. Some tell of Paris abducting Helen whilst others tell of her being seduced by the Trojan Prince, potentially with Aphrodite using her powers to ensure Helen fell in love with Paris. In either case, Helen would leave Sparta in the company of Paris, with Paris also helping himself to a large quantity of Spartan treasure. Now acting as man and wife, Helen and Paris were said to have consummated their love upon the island of Cranae in the Laconian Gulf. ​Upon the discovery of Helen’s absence, Menelaus would have his brother, Agamemnon, King of Mycenae, invoke the Oath of Tyndareus, and kings and heroes from across Greece were called to arms. A Greek armada gathered at Aulis, and this armada set sail for Troy, hence the idea of Helen being the woman who “launched a thousand ships”. In Troy, the arrival of Helen with Paris, brought awareness that there would be consequences for the Trojan people, but there was no clamouring for Helen to be sent back, even when the Achaean forces arrived at Troy and demanded the return of Helen and the Spartan treasure. So war ensued, and whilst there was some dissenters amongst the Trojan elders, that it would be best if Helen was returned, no serious effort was made to do so. Helen though found herself isolated within Troy, a stranger in a strange land, where she was viewed as the person who had brought destruction upon their city. ​Helen had only Paris by herself, although it was said that Hector and Priam were kindly towards her, but eventually Helen would find herself very much alone, for Paris would be killed by Philoctetes. The death of her “husband” saw disagreement amongst the Trojan defenders, not about returning her to Menelaus, but about who should now wed the beautiful Helen. It was eventually decided that Deiphobus, over Helenus, would now marry Helen, and it was a marriage in which Helen had no say in the matter. ​The Trojan War was drawing to a close and perhaps Helen realised the fragility of her situation, but writers in antiquity tell of Helen being a help to the besieging Achaeans, but also a hindrance. Helen would do nothing to hinder Odysseus when he came into Troy in disguise to steal the palladium; the removal of the palladium from Tory being one of the perquisites in prophecy of an Achaean victory. Yet, when the Wooden Horse was pulled into Troy, Helen recognised it for what it was, and it was said that Helen walked around it, imitating the voices of the wives of the men hidden within. Some have seen this as an attempt to aid the Trojans, whilst others see it as an effort by Helen to show how clever she was. ​It was also said by some that Helen would wave a torch to signal for the Achaean fleet to return after the gates of Troy had been open by those within the Wooden Horse. Some also tell of how Helen herself was close to death at the hands of Menelaus, for the King of Sparta was angry at the actions of his wife, although of course the hand of Menelaus was stayed before and injuries could be inflicted. Helen would then accompany Menelaus to the Achaean boats. Eventually the Achaean fleet would set sail for their homes, and of course many of the Achaean leaders had their own trials and tribulations to deal with on the return voyages. The return of Helen to Sparta though was relatively smooth, although some tell of the journey perhaps taking eight years. ​A less common version of the Helen of Troy tells of this title being a misnomer, for Helen was never at Troy. 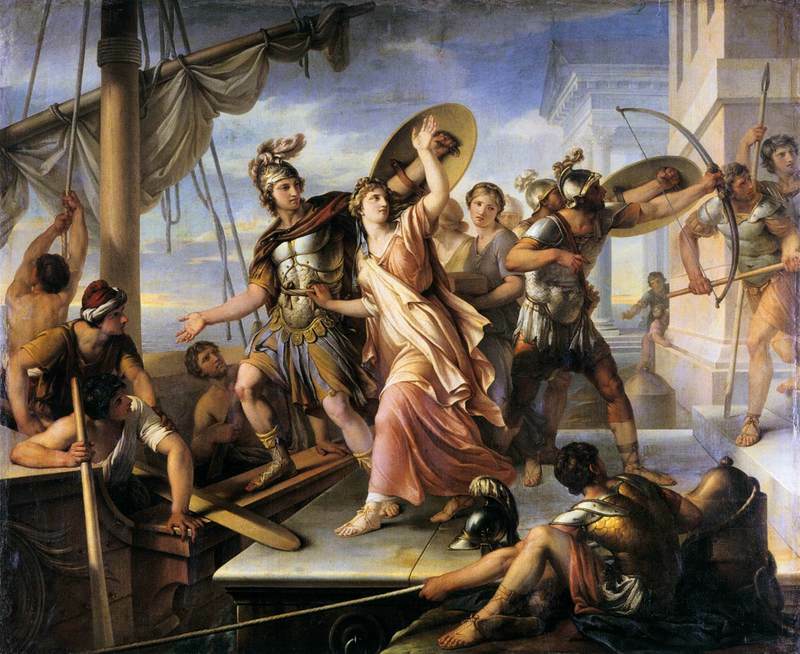 Certainly Helen left Sparta with Paris, but when Paris’ ship landed in Egypt on its way home, but when King Proteus of Egypt discovered that Paris had broken the rules of hospitality, taking Menelaus’ wife and treasure, Proteus ejected Paris from his realm, not allowing Helen to travel onwards to Troy. ​This was why the Trojans could not give up Helen when the Achaean army demanded her, and so a pointless war was fought, throughout which Helen was safe in Proteus’ palace. Alternatively, Helen was hidden away in Proteus’ kingdom by Zeus or Hera, whilst a cloud was crafted in her image and sent to Troy in her stead. Thus it was that Menelaus retrieved Helen from Egypt, not Troy, after the end of the Trojan War. ​It was commonly said that Helen and Menelaus were happily reconciled after their return to Sparta, and certainly it was a happy palace which Telemachus visited when he sought news of Odysseus, his father. ​Now some claim that Iphigenia was a daughter of Helen, born to the daughter of Zeus, after her abduction by Theseus, who was then given to Clytemnestra to care for; more commonly though, Iphigenia is named daughter of Clytemnestra by Agamemnon. Most commonly though it was said that Helen had but one child, a daughter called Hermione, who though promised to Orestes, was married instead to Neoptolemus, but as a result Neoptolemus was killed by Orestes, and so Hermione and Orestes would eventually wed. Some also tell of Plisthenes and Nicostratus being sons of Helen and Menelaus, although more commonly it was said that Nicostratus was the son of Menelaus and a slave woman. It is also said occasionally that Helen became pregnant by Paris during her time in Troy and became mother of Bunomu, Corythus, Aganus, Idaeus, and of a daughter Helena; all though were said to have been dead by the time Troy fell. ​There are differing endings to the story of Helen, endings given by different writers in antiquity. 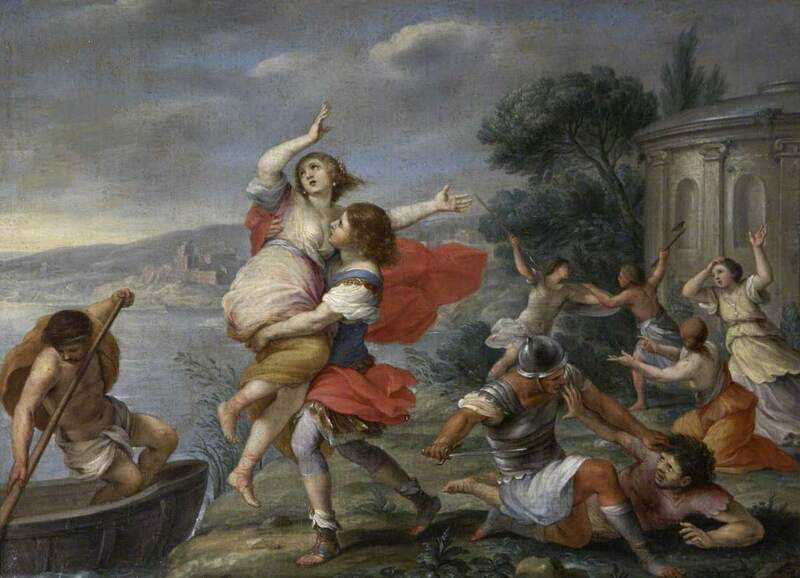 One version tells of how Helen would spend eternity in the paradise area of the Greek afterlife, be in the Elysian Fields or upon the White Island; but if Helen was in the Elysian Fields then she was alongside her husband Menelaus, but if upon the White Island, then she had somehow become married to Achilles. There is one story which actually deals with the death of Helen, and in keeping with many stories from Greek mythology there is no happy ending for the Queen of Sparta. Upon the death of Menelaus, Helen was driven out of her home by the illegitimate sons of Menelaus, Nicostratus and Megapenthes. There were relatively few places in Greece where Helen might be safe, for many still blamed her for the Trojan War, but upon the island of Rhodes was Queen Polyxo, a woman who Helen considered a friend. Polyxo though had become a widow during the Trojan War, for her husband, Tlepolemus, had been killed by Sarpedon; and secretly Polyxo blamed Helen for her husband’s death. Thus when Helen arrived in her palace, Polyxo sent servants, who were disguised as Erinyes, into Helen’s rooms, and Helen was killed.